Actor, writer, and comedian Aubrey Plaza is quickly becoming one of her generation’s brightest young talents. Plaza currently stars in NBC Emmy nominated and critically acclaimed comedy series “Parks and Recreation” as the deadpan and witty April Ludgate. She also starred in the movie ”The To-Do List” as a high school grad who makes it her mission to gain more sexual experience before heading off to college. Written and directed by Maggie Carey, the film was touted as the female version of “Superbad.” Bill Hader, Andy Samberg, and Rachel Bilson co-star. Plaza also starred in the indie film “Safety Not Guaranteed,” which follows two magazine employees on an assignment to interview a man who placed a classified ad seeking a companion for time travel. Jay and Mark Duplass produced the film and Mark Duplass, Kristen Bell, and Mary Lynn Raskjub also star. She also starred in “10 Years” opposite Channing Tatum in 2011. Plaza played the role of Olivia, the wife of Brian Geraghty’s character. When the couple goes to his 10-year reunion, Olivia realizes that he is a very different person than he was in high school and that she doesn’t know as much about him as she had initially thought. The film also starred Rosario Dawson, Justin Long, Kate Mara, and Lisa Kudrow. Plaza’s other movie roles include “Scott Pilgrim vs. The World,” Judd Apatow’s “Funny People” and “Mystery Team.” Plaza also guest starred in an episode of the IFC comedy “Portlandia,” an original comedy series that illustrates the people and values of Portland, Oregon and stars Fred Armisen of “Saturday Night Live” and Carrie Brownstein from the Portland band Sleater-Kinney. Her additional credits include the hit online series “The Jeannie Tate Show,” ESPN’s original web series “Mayne Street,” as well as a guest appearance on “30 Rock.” Plaza has been performing improv and sketch comedy at the Upright Citizens Brigade Theater since 2004. She also performs standup and has appeared at the Laugh Factory and The Improv. Do you want to hire Aubrey Plaza? Directly request a quote. In 48 hours we can send you the availability of Aubrey Plaza If you would like to book Aubrey Plaza, Entertainment Booking Agency is the right place. 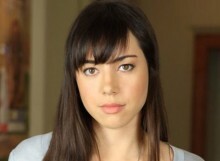 We will offer you the best price and contact the management or we directly contact Aubrey Plaza. For corporate appearances or speaking engagements you can contact our agents and the will help you true the process. Tags: hire Aubrey Plaza, Aubrey Plaza booking, book Aubrey Plaza, Aubrey Plaza appearances, find more information on booking Aubrey Plaza for appearances, Aubrey Plaza speaking engagements, Aubrey Plaza endorsements/spokesperson, Aubrey Plaza appearance fees, Aubrey Plaza booking agency contact info, biography of Aubrey Plaza, Contact an artist booking talent agent find a speakers bureau that can book Aubrey Plaza, speaker booking agency for Aubrey Plaza, Aubrey Plaza booking agency, Aubrey Plaza booking for corporate event. EBA is one of the biggest entertainment booking agencies in the World. We book hundreds of celebrities, artist, athletes and speakers in a year. Important to know is that we are not claiming to be the management of Aubrey Plaza. We are not the official agent for Aubrey Plaza. Companies from around the globe book these artists and speakers true our company be course we have one of the biggest networks and we always have direct contact with the artist or the management. We help you to find the right celebrities for your corporate of private events. Please contact one of our agents to get free advice and we will help to get the world-famous artist on your party.